Orchids are one of the top five plant groups with conservation issues in New Zealand. 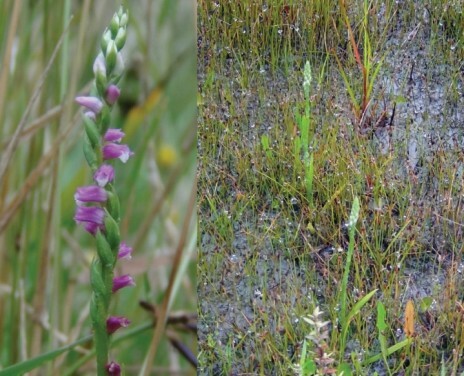 Unlike many other endangered or uncommon plants, propagation of native orchids from seed for conservation has not been attempted in New Zealand before. With the help of funding from the Otari Wilton’s Bush Trust, the Wellington Botanical Society and the San Diego County Orchid Society (USA) we will implement seed germination techniques commonly used overseas to propagate New Zealand’s rare and endangered orchids. Ladies tresses orchid (Spiranthes novae-zelandiae), a native species currently ranked as Nationally Vulnerable. Habitat destruction is one of the main causes for the continuous decline of this orchid. Photo: C.A. Lehnebach; © Te Papa. Orchids are well known by their unusual flowers and elaborate pollination systems. Many orchids rely on insects to produce seeds and disruption of this relationship may threat orchid’s survival. Orchids, however, also require another organism to survive; a fungus. Unlike other plants, orchid seeds lack of endosperm; the nutritious tissue found inside seeds. 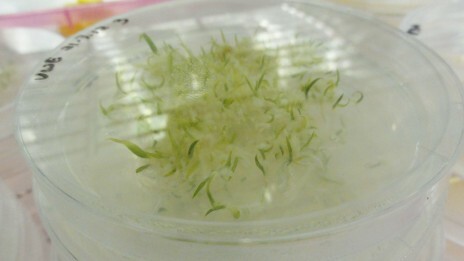 This tissue provides food to the embryo during germination and until the very first leaves are formed. Seed of the native spider orchid Nematoceras trilobum. The round structure in the centre is the embryo and the net-like tissue around it is the seed cover. Orchid seeds are very small; this one here is less than 1 mm long. Photo: C.A. Lehnebach; © Te Papa. 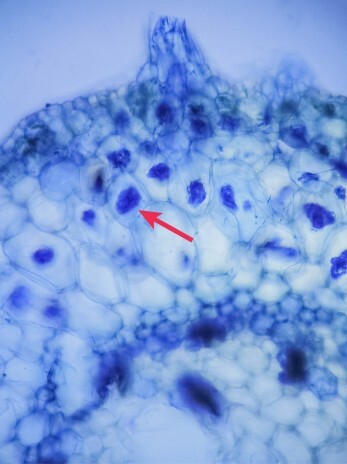 To overcome this peculiarity, orchid seeds use a fungal “infection” to get carbon and mineral nutrients from the soil into the embryo and developing seedling. This association is essential for orchid seeds to germinate and it may last for the entire life of the plant. Inside the infected cells, either in the roots or the base of the stem, the fungus forms roundish structures known as “pelotons”. Some orchids are very flexible and may use a variety of fungi species while other are species-specific and will only germinate if the correct fungus is present in the soil. 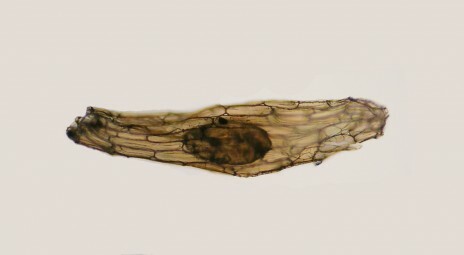 To artificially infect orchid seeds with its fungal partner, first the pelotons need to be dissected out of the roots of an adult plant and cultured in a special agar medium. Within a couple of days, several fungi will grow in the plate and sub-cultures need to be set aside to obtain pure cultures of each fungus. After the fungus has been isolated and identified by analysing its DNA, seeds can be put in contact with the fungus to promote infection and seed germination. After about three months, if the correct fungal species has been used and the infection has successfully taken place, tiny small green leaves will appear in the plate. At this stage the seedlings are less dependent on the fungus and can produce their own food. Plate with seedlings of a terrestrial orchid growing at Kings Park and Botanic Garden (Perth, Australia). Photo & Copy Rights: Jonathan Frericks. Jonathan Frericks, MSc student at Victoria University of Wellington, has travelled to Australia to learn these techniques from scientists at Kings Park and Botanic Garden (Perth). His trip to Perth was funded by a grant from the Australian Orchid Foundation. As part of his thesis, Jonathan will isolate and identify the fungal partner of a selected group of native terrestrial orchids and, in collaboration with Otari Wilton’s Bush, cultivate a subset of them. Jonathan’s project will gather information vital to implement seed germination methods for conservation purposes and understand orchid-fungal interactions in our native orchids. This is quite interesting. Austria’s and New Zealand share a few species of orchids, including the photographed species which is rare here. In Australia a few species of orchids have been propagated, and that can be a difficult task, but it is probably harder to introduce orchids back into the wild. This is why the vegetation needs to be protected, whether it contains rare or common species. The presence of orchids on a site will indicate that the site is of fair quality.